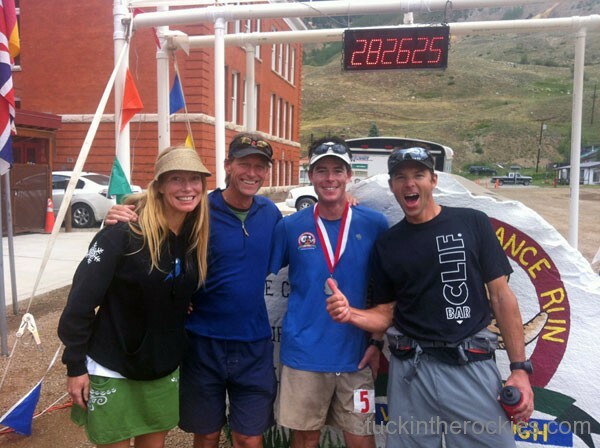 The crew– Christy, Neal Beidleman and Chris Davenport. They deserve a lot of the credit for getting me here while it was still breakfast hour on Saturday in Silverton. Thanks guys, you’re awesome. In the days that follow this enormous undertaking, I’m usually so drained– mentally, physically, and emotionally– that I struggle to assimilate all that took place. 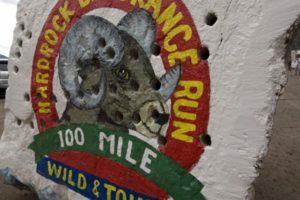 I recall it in bits and pieces– mental images of the course, fragments of conversations with crew and pacers, or memories of thoughts as to how I was feeling or what was happening. To look back on it can almost take on a Hollywood-esque “life flashing before you eyes” retrospective, like a montage of moments pasted together in a crude slideshow. Having had a few days to try to put it all together, one thing is clear, it was a great day. I kissed the rock in 28:20, a PR by two hours (despite the 2.5 mile longer course), and I managed to finish feeling stronger and more together than ever before. I always consider this race to be one of a runner versus the course and clock, but when I learned that I had somehow climbed up to 5th place, considering the talent at the front end of the field, I realized that this is one of the best finishes I’ve had in all the races I’ve done. You can see the results here. In hindsight there were a whole host of reasons why things went so well, some big, some small. Rather than delve into the minutiae, a few things stand out as significant factors why I had the day I did. This jacket didn’t come easy. Will I ever wear it? Probably not. But you can bet I’m psyched to have earned it. 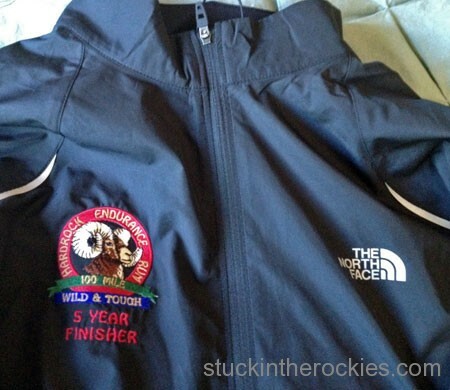 This was my 5th time running Hardrock and my 10th 100 miler. Put simply, there is no substitute for experience. Every lap I’ve done here has provided countless learning lessons. I don’t like to make the same mistakes twice, and I pay close attention to what does and does not work. Food, gear, training, pace, the less tangible issues of handling the night and the strategies of the course layout– I’ve figured out what works for me. My crew– Christy, Neal Beidleman and Chris Davenport– kept things moving well. I was on track for a PR from the start, and with their help I continually gained on it as the race progressed. I said I wanted to pare down my aid station times, and we streamlined the stops to a mere 26 minutes total, down from about 50 in 2010. Huge thanks to the three of them. I should also thank mother nature for our light snow year and the non-existent spring ski season, which allowed me to actually run a proper amount in the months up to the race. Usually I’m woefully light on miles as it approaches. In a general sense, that’s why I had such a good day. Sorry if I didn’t reveal any useful Hardrock secrets. Good question. I didn’t really say much, though I did have an answer– I respect the distance and the course. Put more specifically, I run my race at my pace. I’m careful to pay close attention to how I’m feeling, I always consider what’s yet to come, and I make sure not to let small problems get bigger. 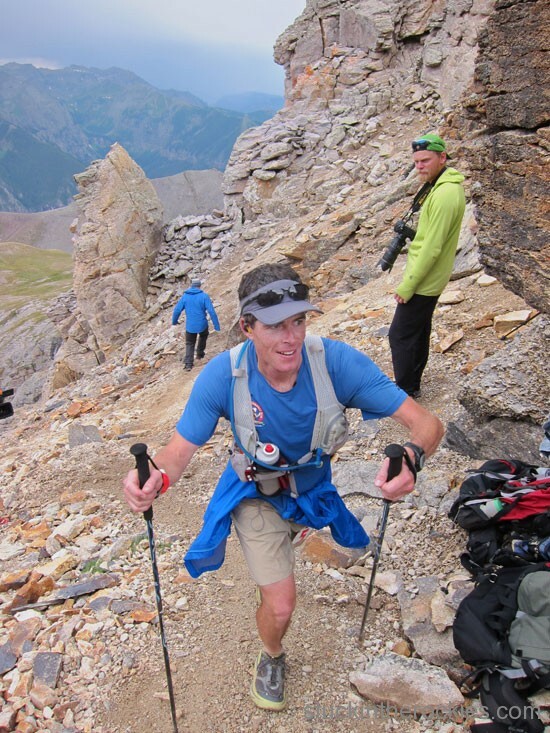 Roch Horton snapped this shot of me near mile 33 as I crested Virginius Pass, 13,100 feet. It was about 3:15pm on Friday, and I was holding steady somewhere around 20th place. Telluride is down in the valley in the distance. That all seems obvious, but in my opinion, many runners ignore some or all of those things. Particularly when it comes to the front end of the race, people often run out faster than they should, and chase each other so as not to let anyone get too big a lead. That’s not running at your own pace. To push it early and through the heat of the day on a long course with so much altitude and elevation is crazy in my opinion, yet you see it all the time. That’s not being respectful of the course. For all but the most fit (and lucky), these early decisions cause many runners to test the limits of being minimally hydrated and light on calories. If that happens and it’s left unchecked, things always start to unravel. 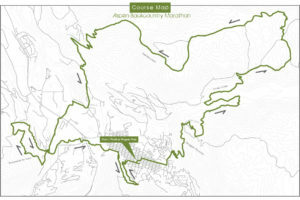 On some 100 mile courses you might be able to hang on and sneak into the finish, but not here. It’s going to catch up to you. And then the night comes. My friend Tim Mutrie dubbed me the “Night Stalker” after this year’s race. At first I rolled my eyes at the sensational handle and said I just got lucky, but he’s actually right. I ran comfortably with friends through the day, hovering around 20th place. I stood still in the overall ranking for 15-16 hours, just taking care of myself, eating, drinking, getting through the heat of mid day. As the sun set, at mile 52 or so near Engineer Pass, I started moving up. But the thing is, I wasn’t moving faster, I was just holding steady, and everyone else started slowing. They always do. Over the next 12 hours to the finish, my steady pace took out the slowing pace of much of the front end, who by pushing it hard early on, were being ordered by their bodies to slow down. And that’s how you end going from 23rd to 5th. It’s a tortoise and hare analogy. Unless you’re truly an elite ultra runner with experience on a course like this– and I mean the best-of-the-best– you should take it easy through the entire first half. It could help you to finish feeling relatively good and somewhat coherent, and who knows, you might even finish better than you think. This race is so cool, but it’s so hard to gain entry and requires so much effort, that to go out too fast and suffer through it all is no way to experience it. Of course if that sounds boring, you can go out fast and maybe things will work out. But you’ll be risking getting sick, feeling terrible, taking a nap in the dirt on the side of a mountain, and the dreaded DNF. I know how I like to do it. – I put down just about 50 gels, of all types, brands and caffeine levels. – I drank 12 handheld bottles of water with Nuun tablets and about 11 liters total from a bladder with Accelerade. – I put down 27 S-Cap salt pills, 7 cups of flat Coke and 8 cups of chicken broth. – I wore Hokas (Stinsons) the entire race, and completely destroyed them. They’re done. I changed socks 3 times. – I used poles up Oscars, Virginius, Engineer, Handies, from Maggie, and Dives Basin. 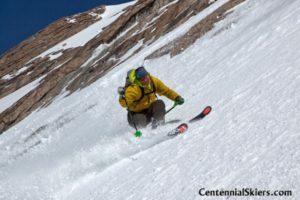 Skiing the Dragon Egg Couloir on Mount Meeker. What an awesome line. Congratulations on 5th, man. The last three years I’ve watched you hang back around 20th or so — if you can call that “back” — until late in the race then slowly pick people off. I commented that exactly to GZ the other day (he paced Tim Long from Grouse this year). Interested to see the consumption. I don’t really race but I run long, and while I’ve dialed the hydration I get burned on energy sometimes. Need to up it some. It’s easy to let the miles click by eating nothing, and then it’s too late. Ah come-on Ted,wear the jacket,(at least when you go visit Neal).Great run and write-up,always thought it was mandatory at Hardrock to slow down and have a suffer-fest in the last half,so that’s where i went wrong,Whoo-hoo,bring on 2013!Lot of really good advice,thanks.Enjoyed talking with you,hope our paths cross again next year,tell Neal we need to meet in Telluride next year for a Get High reunion run,hopefully a Hardrock training run for him. Congratulations to an awfully fast tortoise! Your patience in pace really paid off! Randy, I’ll definitely wear it to Neal’s next time I’m over. I love to get him going. MtnRunner, eat, eat, eat. The more the better. I bet I could win a gel eating contest if there was one. I found your performance at this year’s Hardrock, above all others, the most impressive. When you rolled into Cunningham right after I’d just left Nick there, I was in awe — how on earth had you made up so much time/place? Purely awesome. As for the Hokas you destroyed, I think <a href="https://lh6.googleusercontent.com/-NPqAburqEno/UAlSQiSePZI/AAAAAAAADPs/OwYwchMwhGY/s778/IMG_4608.JPG"this picture pretty much sums it up! Nice photo. Those things have completely collapsed! I tore through the mesh on inside of both of them, right along the sole. Good thing we didn’t have to go much further. And thanks for the flattering comments. I kept waiting for things to slow down, or for the night to catch me. I guess it was just one of those good days where you stay ahead of it all. Awesome, Ted. A huge congratulations on an amazing accomplishment! Nice job to Christy, Neal, Chris as well. Go Team Mahon! This is one of the most helpful HR reports I have read. Congrats on the great race. I hope when the time comes I can maintain the kind of discipline you displayed. Thanks David. Like yous said,”…when the time comes….” It’s so hard to get through the lottery process and it has become such a privilege to run, you should want to remember it as a good time. Start steady and finish strong, words to live by! Insane achievement Shred! PRBO??!! Awesome run Ted. It was cool to see you finish up there so high. A testament to years of consistency and just as importantly – racing smart. Whether its 100 milers or 10Ks, the tips you gave about running your own race are incredibly valuable. You should be really proud – that was an inspiring run. KP, tempting, but no post race blowout this time. We still put up a good PRBO here and there though, for old times sake. “Run your race at your own pace, Pay close attention to how you’re feeling, always consider what’s yet to come, and make sure not to let small problems get bigger” Such perfect words live by. Thanks for being such an awesome mentor Ted. It’s not as if I can’t go out fast myself, I just think that deep down inside, I’m too afraid of blowing up and having a miserable time out there, so I take my tortoise approach. I don’t have the guts to put it all on the line like you. Way to go grab the bull by the horns, even if it started to fall apart at the end. Jake, you know it better than most I would imagine. Your race can’t be about chasing people. I run on my own when I’m training, so I should run on my own in the event, too. And I guess I’m just blessed with an iron stomach. It is kind of gross to think about. Awesome accomplishment Ted! We told several people to watch for you, and it was like “Ted who”? Just watch on Saturday morning, you’ll know who he is 😉 You are a great inspiration and very humble about your abilities. Have a great finish to summer! Ted, that was an awesome race you put together this year. Super psyched and happy for you. 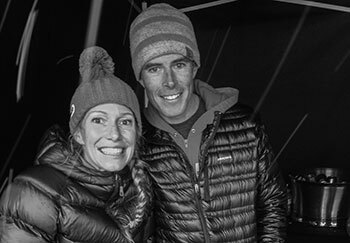 For those that follow Ted and Christy’s adventures here and haven’t experienced the San Juan mountain high country where this course is or what it’s all about, I want to assure you that the HR is one of the toughest, most daunting single stage running races imaginable. If you are really out there racing it, the HR is far beyond reasonable. But most startling is that Ted made this mind-numbing suffer-fest look — quite honestly — easy. I didn’t think it was possible, but that’s exactly what he did. It was a pleasure to run the third quarter of this year’s race with you Ted. Well done my friend! Well done Teddy! Awesome effort – and somehow appropriate, at this crazy, one-of-a-kind race, to see humility and respect so richly rewarded. It’s all in the coaching, Neal. Like you’ve always said, the first step is truly believing you can do something, then the rest falls in line. Thanks for your help, again. Let’s hope you get a little lottery luck this year. Well done, Ted. Andrew and I followed you online, which was great fun. Your blog is always fun and inspirational and especially so right now. We all sort of have our own Hardrock to complete. You just sort of put one foot in front of the other and keep plugging along…slowly at first so as not to blow up! We can all take great lessons in patience and persistence from the FIVE Hardrocks you’ve completed. Glad to meet you too, and to hear you had a good go of it. And bonus points for getting your feet wet to save the fawn stuck in the bog. You should get an extra lottery ticket for that!